Days after George H.W. 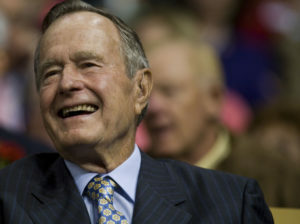 Bush’s death, family, friends and staff are remembering the patriarch of one of the country’s most prominent political families, while Washington begins a week of ceremonies to honor the 41st president. Here are some recollections about Bush — World War II veteran and father of the 43rd president — from some of the people who knew him best. Interviews were edited for length and clarity. Roussel served as press secretary to Bush when he was in Congress, at the United Nations and at the Republican National Committee. One weekend, when Bush was the chairman of the Republican National Committee in 1973 and 1974, he and Bar [First Lady Barbara Bush] and myself went up to Mackinac Island, Michigan — about 15 minutes from Detroit in a little plane. I was in the front seat, with the Bushes in the back seat. When we took off, the door on my side was not fully closed. It was making a hissing noise as the air was flowing through. As we climbed higher and the pressure got higher, I was watching the crack moving up the door. I pointed it out to Bush. The door flew open and hit the side of the plane. The plane lurched a little bit. It scared the heck out of me. I’m looking down and seeing nothing but water. Bush leaned over calmly and said we have to get the door closed so it won’t go into the propeller. It meant me leaning out over the edge of the plane. It was like trying to move concrete. He told the pilot to slow down the plane, and it felt like the plane was sitting still. The two of us tried to pull the door closed. We gave everything we had and it pulled shut. When we landed, Bar looked at me and said it looked like I’d seen a ghost. Under a very difficult circumstance, he was calm and collected and right away took charge and gave directions to the pilot about how to alleviate the problem. Years later, when he ran for president, I thought ‘That’s the kind of person I want as president.’ Under great pressure, he exerted calmness and excellent judgement. Those traits are notable to have in a president. Dannenhauer served as a staff assistant and personal aide to President Bush, and went on to serve as his chief of staff for two years after he left the White House. He first met Bush as an intern in the vice president’s office. When Bush was president, a head of state he knew sent him a traditional uniform, one with a sombrero and a holster for a gun. 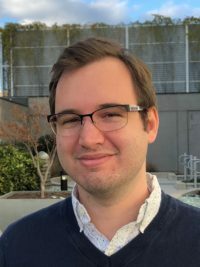 He decided to put it all on and walk down from the Oval Office to National Security Adviser Brent Scowcroft’s office, not knowing who he’d see along the way. We helped him get it on. He had the holster and wanted a gun. One of the Secret Service agents took the bullets out of his gun and gave it President Bush to put in the holster to walk to Scowcroft’s office. That just showed his sense of humor. Throughout all of Desert Storm, there was always laughter. Even in the tough times, he’d have Gen. Colin Powell and the secretary of defense in the Oval Office. Even though major decisions were being made, he always made sure people laughed. Bates served as Bush’s traveling aide beginning in 1978. He later served as White House cabinet secretary. The whole 1980 convention just really stands out in my mind. It was remarkable in that President Ronald Reagan went to the convention and had not picked a vice presidential candidate. Bush was really the logical choice. Bush went to the convention and thought there would be a good chance he’d be tapped to be the vice presidential nominee, but he wasn’t sure. We weren’t sure. David Bates, far left, with George H.W. 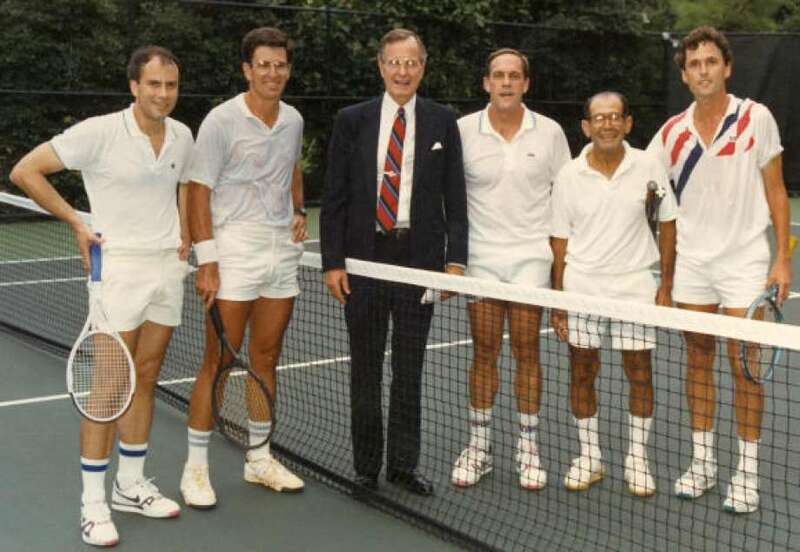 Bush, center, and others at the White House in 1989. Photo courtesy of the White House and George Bush Library. Then there was reporting at the convention that Reagan was going to announce Gerald Ford as the VP nominee. Bush shrugged his shoulders and went up and gave a very short and sweet speech at the convention. It was typical 41. It was not a thing about himself. It was all pro-Reagan, pro-party. After the speech, we walked back to the hotel and he said, ‘Well, you all go get some beer, and we’ll just have a little party.’ He just thought the Ford thing was a done deal. That was the end of the line. And then of course it fell apart. Popadiuk served as the first U.S. ambassador to Ukraine under President Bush. He later served as the executive director of the George Bush Presidential Library Foundation at Texas A&M University. There was a little pond outside Bush’s office, and we had it stocked with bass so he could go fishing whenever he wanted — catch and release type of stuff. He enjoyed doing that. He enjoyed walking the dog around the grounds. You got to see kind of the private side of him, not just the public side. You saw him fishing and walking around and running into students. He was always willing to engage students who would be passing by on the grounds of the library in conversation or stand and take a photo with them. He was always energetic and full of life. 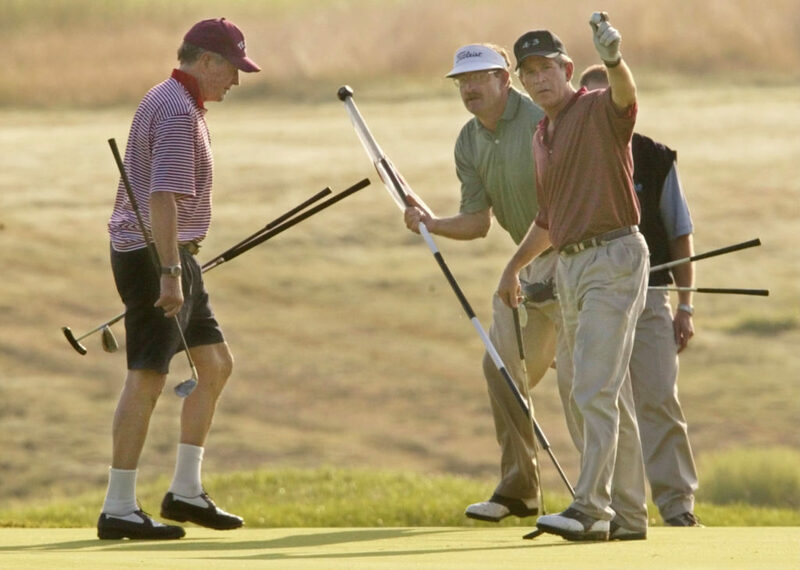 Raynor is a longtime friend of Bush and the PGA professional at the Cape Arundel Golf Club in Kennebunkport, Maine, home to the Bush family compound known as Walker’s Point. So now I’ve got a responsibility as head PGA professional to get this exploding golf ball hit. Well, luckily, Brent Scowcroft hit a poor drive off the first hole and of course I was readily available to say, ‘Brent, I will give you a mulligan and give you another try and I’ll even T the ball up for you.’ And of course the president is hysterical trying to make sure the press has everything rolling because he knows what’s about to happen. And of course it happens and he’s hysterical. James served as assistant secretary for public affairs in the Department of Health and Human Services under President Bush, and as associate director of the Office of National Drug Control Policy. The president was touring the D.C. General Hospital with an emphasis on boarder babies — those babies that were born to chemically-dependant moms, and very often the moms would leave the hospital and the babies would become boarders there. It was a real issue at the time. When we went into the unit, a baby was crying, and the president intuitively, with no prompting, went over and picked the child up. It was one of those moments when the baby looked back at the president and smiled. The baby had no way of knowing he was being held by the most powerful person in the country, the president of the United States. [The president] didn’t stop to think about race, creed, identity, gender identity, anything; it was a baby that needed to be held. We’ve gotta learn that, how to be human beings, learn how to be better about offering care and giving love. Just to see the president’s desire to reach out and comfort that child was so special.